Developed as part of our Xtraction Range - a 3 stage method for deep cleaning and maintaining carpets, this Gompels Heavy Duty Stain Remover is a powerful addition to your existing cleaning routine. Suitable for spot cleaning and pre-treatment, this multi-purpose cleaner comes in a durable bottle with nozzle for easy distribution. 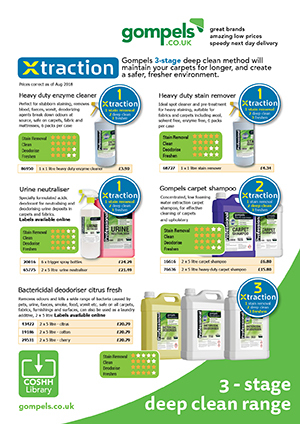 The enzyme, detergent and solvent free design works quickly to separate stubborn and ingrained soils from your surfaces and allows them to be removed with minimal effort. 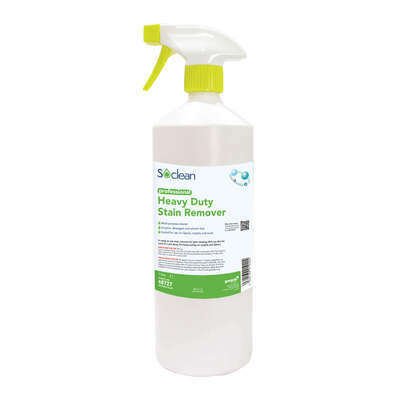 Suited for use on fabrics, carpets and wool, this handy stain remover is a functional choice in your existing routine that will ensure every stain or mark is dealt with appropriately.